In an attempt to learn a little more about my camera the other day, I took some pictures of my yard. I didn't really have a goal in mind - just to try to take some interesting pictures in what was basically a very dead yard. It's not yet spring, of course. I constrained myself to close-up shots (with the 24-70 lens) or at least unusual angles. Most of the pictures were a little flat (it was mostly overcast), so I experimented with excessive contrast. 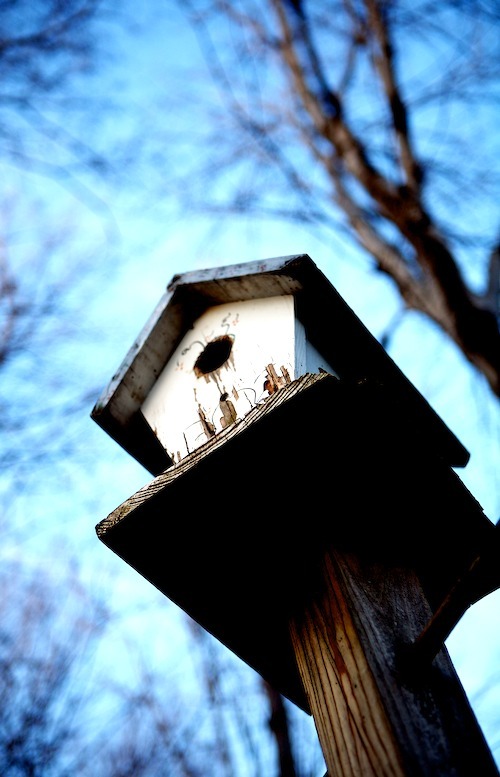 My favorite shot (despite the focus being a tad low on the house - ideally I wanted the hole to be on the focal plane at f/2.8) is this one, of a birdhouse we have in the back yard. The opening in the trees was nearly a perfect fit. Others follow, with minimal commentary. Here are several shots of a dead flowering "thing" we have next to our driveway. It's not a tree and it's not a bush. It's like a woody plant. I'm surprised these "flowers" lasted through the winter. As recently as last week, these were completely covered in snow. The first shot I took was of part of a tree that fell down last year. I chopped it in half and drug it off the grass. It provided food for a neighborhood rabbit. The first sign of new growth. At the increased contrast, it really takes on a new life than as shot. The glowing green coming from the darkened dead leaves on the ground really helps to push the idea of life springing forth after many months of death or rest (i.e. winter). 2 Responses to "High Contrast Dead Yard"
But I love the dead & high-contrast look. I'm pretty sure the dead flowering "thing" is a yucca. 🙂 We have lots of those in New Mexico where I grew up.